A comprehensive "hidden stories of the Pacific" media and communication book about many of the region's major issues of the past two decades such as the Fiji coups, Papua New Guinea's Bougainville war and resource development crises, nuclear testing and health challenges, environ... read full description below. 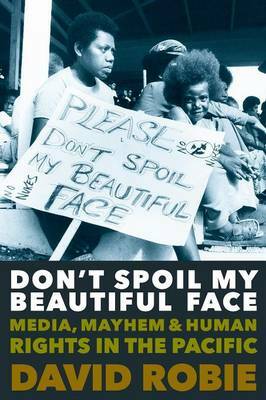 Don't Spoil My Beautiful Face introduces readers to reportage of major Asia-Pacific socio-political and environmental issues over three decades by an independent journalist and media educator. It examines contemporary media concepts such as critical development journalism, conflict-sensitive journalism and deliberative journalism. And it argues for a more comprehensive, reflective and in-depth media response to the region's challenges from Tahiti Nui and Polynesian nations in the east to Papua New Guinea, Indonesia, the Philippines, Timor-Leste and West Papua in the west. David Robie has been committed to developing quality journalism in the Pacific, and especially in developing a "Pacific brand" of journalism. A timely media revisitation of the bloody conflicts and atrocities that have plagued this vulnerable Pacific region. An invaluable resource for journalists and journalism students. David Robie has been an impassioned chronicler of Pacific currents for decades ... from the bloody independence struggles of the 1980s to the attempts to chart a nuclear-free course. An excellent sweep through the recent history of the Pacific and elsewhere constructed around the story of the author's life. "This is an extraordinary 'secret history' of a vast region of the world of which David Robie has been a rare expert witness. What makes this epic work so timely is that it allows us to understand the Asia-Pacific at a time of renewed Cold War ambitions and dangers." Dr David Robie is director of the Pacific Media Centre and professor of journalism in Auckland University of Technology's School of Communication Studies. He is the author of Eyes of Fire: The Last Voyage of the Rainbow Warrior and Mekim Nius: South Pacific Media, Politics and Education. He is also founding editor of Pacific Journalism Review, convenor of Pacific Media Watch and publishes the media blog Cafe Pacific.